I’ve done many posts on things you can do with long exposures (see Disappearing Act and Long Exposures, DSLRs: Photographing Fireworks, Lightening and Long Exposure, and Long Exposures), but here in another one: Star Trails. First, what is “a long exposure”? When we talk about the length of exposure, we’re talking about how long the shutter is open in your camera to allow light in. Now, you may already know that how “bright” the image ends up being (or the exposure value) is dependent on the combination of shutter, aperture, and ISO settings. These 3 settings in combination control how much light reaches the sensor as well as how much light is required to get a given exposure value. So, why would we talk about the length of the exposure separately? How long you open the shutter determines whether you freeze motion or show motion blur and how much. So, when we talk about a long exposure, we’re really talking about showing motion in our images. Getting good exposure still requires a combination of setting the shutter, aperture, and ISO appropriately. So, now that we’ve reviewed the basics, let’s get into a couple of examples of what you can do with long exposures (slow shutter speeds). When we look at the stars, if we look at them long enough, then appear to move in the sky. This is because the earth is rotating so the stars rise and set just like our closest star, the sun. They actually move fast enough that we can record their path as a “star trail” if we leave our shutter open long enough. You can also take a series of photos and use software to combine them. 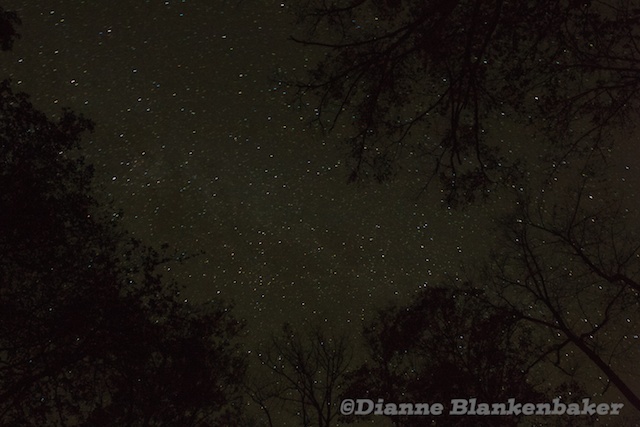 Find a location where it’s very dark and you are far from the city so you can see lots of brilliant stars in the sky. Attach remote control to camera (a remote is an absolute requirement for star trails). Place the camera on a tripod and frame what you want in the image and determine how/where you will need to focus (see next step). If you have something in the foreground on earth (like the trees in my image above), you might want to check a depth of field calculator to determine whether you need to find focus on the trees of whether you can simply focus at infinity. If you are focusing on something fairly close, you may need to use a flashlight or focus assist on your flash to find focus in the dark if you cannot see well enough to focus manually and your camera can’t see well enough with the available light to focus automatically. Just shine the flashlight on the thing you want to focus on, point your camera at that thing and lock focus (hint: this is easiest if you’re using back-button focusing, but that’s a subject for another blog post). In most cases, you will be shooting wide enough and at objects far enough away that you can simply manually set the focus at infinity and everything will look sharp. In my case, I was using a full-frame camera with a zoom lens at 27mm and my aperture at f/11. Worst case, focusing at infinity would keep everything 8 feet and further sharp. Since the trees were more than 8 ft above my head, I just set my focus at infinity. Now that you’ve found focus and locked focus, you can get your camera set on your tripod and framed the way you want again. Make sure your camera is set to “Bulb.” For some cameras, this is a setting on the shooting mode dial (where you pick Auto or Manual). For other cameras, this is an option in the shutter speed selection. Make sure your remote is set to “Bulb” as well. Bulb allows you to manually open the shutter and then manually close it. Because there was so little light in the area I was shooting in, I wasn’t worried about over exposing the trees with a very long exposure. If you have more ambient light, you might want to stop down more or turn down the ISO. In my case, I did f/11 for aperture and 1600 ISO. I used a higher ISO than usual because I wanted to ensure the sky registered enough light to clearly show the silhouette of the trees. Had I not been so sleepy by the time this shot completed and keeping my husband awake getting in and out of the tent to tend to the camera, I probably would have tried another shot with a lower ISO and longer exposure time to see how long I could get the star trails and if I could reduce the noise. Make sure you have a comfortable and warm place to sit where you can keep an eye on your camera. I was more worried about curious bears than people at our campsite since there wasn’t anyone else around. Also, set an alarm on your phone so you don’t forget when it’s time to close the shutter. For my example, I opened the shutter (by pressing the button on the remote 1x) and then set the timer for 30 minutes. However, I must have bumped the shutter button early because my metadata says the total exposure time was actually 1275.9 sec (21.26 minutes). The longer you leave the shutter open, the longer your star trails will be. However, be aware that extremely long exposures create more noise in the image and can build enough heat in the camera that it will shut itself off (hopefully) to avoid damage. At one time I recall reading a warning that there is a maximum limit to how long you can safely leave your shutter open on a digital camera, but I have not seen anything like that in years so this may be something only relevant for older DSLRs (or perhaps it was just a rumor). When your timer goes off, click the button again to close the shutter and go see what you got! 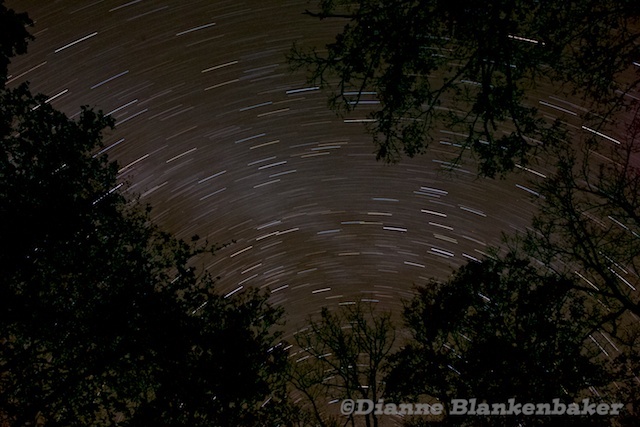 Trivia question: why do the star trails appear in a semi-circular pattern?